Guest poster Neil Oatsvall is a History and Social Science Instructor at the Arkansas School for Mathematics, Sciences and the Arts. His work has appeared, or is forthcoming, in Environment and History, Agricultural History, Essays in History, and the edited collection Proving Grounds (University of Washington Press, 2015). His book manuscript, “Atomic Environments: Nuclear Technologies, the Natural World, and Policymaking, 1945-1960,” is under advanced contract with the NEXUS series of the University of Alabama Press. His Twitter handle is @DctrNO. Return guest poster Vaughn Scribner is an Assistant Professor of Early American History at the University of Central Arkansas. His work has appeared, or is forthcoming, in Atlantic Studies: Global Currents, the Journal of Early American History, Early American Studies, the Journal of Social History, Urban History, Agricultural History, and the edited volume, Order and Civility in the Early Modern Chesapeake. His Twitter handle is @VScrib86. 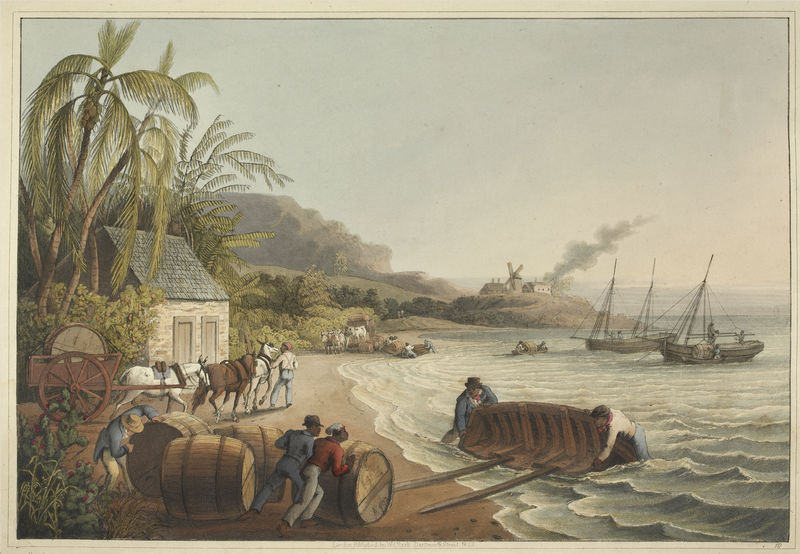 “Shipping the Sugar,” from William Clark, Ten Views in the Island of Antigua, in which are Represented the Process of Sugar Making…From Drawings Made by William Clark, During a Residence of Three Years in the West Indies (London, 1823). While co-authoring in the sciences or social sciences is the norm (and often expected), many scholars in the humanities tend to practice the Lone Wolf strategy. We huddle in our den, surrounded by piles of books, cultivating the nagging fear that someone might be researching something too similar to us. But maybe it’s time to move on from our seclusion. Maybe, in the words of Alan Garner from The Hangover, it’s time to grow your wolf pack (link might be slightly NSFW, as it’s from a rated R film). Other historians have made similar entreaties to the historical community in recent years. In an especially encouraging move, the AHA hosted a panel—“Is Collaboration Worth It?”—at their 2017 meeting. Ultimately, participating scholars concluded that while co-authored pieces are usually not “counted” the same in the tenure process (many wished this bias would change), they are nevertheless well worth the effort. Certain attendees were especially critical of academia’s propensity for solitary work, which often leads to an extreme protectionism—even a sense of singular ownership—of one’s research topic. But why not look beyond this traditional paradigm? More than ever, with digital research outlets, (growing) internet availability, and collaborative programs like google docs, etc., shouldn’t historians be doing everything in their power to bridge the gaps that so often divide us and our research? Shouldn’t we, in short, collaborate with each other to do exactly what expect of our students: critically research the past through the most inclusive, diverse, interdisciplinary, and challenging lenses possible? Our positive experience in co-authoring comes from an article forthcoming in Agricultural History, “‘The devil was in the Englishman that he makes everything work’: Implementing the Concept of ‘Work’ to Reevaluate Sugar Production and Consumption in the Early Modern British Atlantic World.” While the article has a long title, it can be summed up rather briefly: we incorporate the scientific concept of “work”—defined simply as the exchange of energy—to reevaluate the actors involved in the production and consumption of sugar within the early modern British Atlantic world. Such a perspective privileges enslaved laborers and the environments in which they toiled as the most important actors, largely because they accomplished the most work. Ultimately, the article links historical actors in new ways to probe the phenomenon of consumer detachment from the destructive processes inherent in products’ creation. With our experience in mind, we have three tips which helped to make our co-authoring experience valuable and worthwhile. Co-author with someone who has a different specialty than you. One of the most difficult aspects of trying to expand your research focus is navigating a new historiography. Most scholarship is produced by scholars who have been reading within their subfield since graduate school (or before). The expectations for publishing often reflect this, meaning that books and articles must be carefully couched within the related literature. Trying to branch out can often mean weeks or even months of reading before you’re able to start writing, which often discourages many of us from even trying to do something new. Co-authoring provides an easy solution to this because you bring in a partner (or partners) who already know the new literature, saving you time, effort, and hassle. They can also, importantly, direct you to especially important texts that you both need to read, and vice versa. Try to write something bigger and bolder than you’d be able to write on your own. Related to the first point, both of us will freely admit that we could not have written this piece on our own. It’s not just the historiography, although that’s a big part of it. More importantly, we’re dealing with concepts that are frankly bigger than we would have attempted by ourselves. Trying to understand various connections in the early modern Atlantic world is laborious enough, but adding environmental and agricultural connections on top of that? It would’ve been too much, at least for us. Historians have long argued that we need grand narratives and synthetic histories that merge fields. Well, that’s far easier to do (and perhaps more effective) when you can collaborate. Simply put, this piece is better for having each of us authoring it than it ever would have been alone. Finally, working with a friend means that you always have an ally that you can trust in the publishing process. We all have horror stories about the publishing process: frustrating research, bad peer reviews, writer’s block, etc. We’re not saying that this necessarily happened in writing our piece, but over the four years it took us to write the article (yes, it took four years for various reasons), and the many iterations the article went through, we always knew that the other person was looking out for us. Of course, our friends are invested in our lives, but that doesn’t always mean that they care a great deal about every twist and turn of your publishing life. When you co-author with a friend, you always have someone who genuinely cares and who is willing to listen to what you have to say about your research. Besides everything above, there are few things more satisfying than sending a piece to your co-author after reaching your wit’s end, only to have them send it back to you in a much-improved state. They’ve caught all of your awkward sentences or areas where you didn’t analyze your evidence as clearly as possible. And they’re happy to do it because they received an article from you much better than they left it. Who doesn’t want to have that feeling where someone helps you out with the drudgery of editing and just makes your work better? If we historians are genuinely interested in daring, synthetic, sweeping histories, we would do well to find partners in our research endeavors. We’re not saying that every piece you write needs to be co-authored. And, it certainly isn’t a way to get out of work (in fact, in many ways co-authoring is more work than simply writing an article on your own). But, if you’re looking for a way to branch out into new fields, invigorate your own scholarly interests, write big, aggressive histories, and spend time intellectually bonding with a friend? Well, then, it’s time for the Lone Wolf to come out of its cave in search of a pack. Oh, and this blog post—also co-authored.